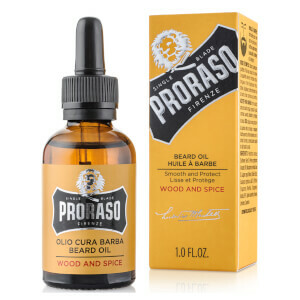 Tame long, thick beards with the Proraso Beard Oil. The gentle formula works to calm, protect and soften the whiskers whilst controlling frizz and preventing the risk of dandruff. The Proraso Beard Oil leaves your skin with a delicate aroma of cedarwood as well as subtle touches of Mediterranean citrus. Your beard will never have looked in such good condition. A.B. Apply to your palms and massage into your damp beard, start from the roots and work to the tip of the beard. Alternatively you can use the beard oil with a beard comb. Sunflower Seed Oil, Avocado Oil, Macadamia Ternifolia Seed Oil, Walnut Shell Extract, Eucalyptus Globulus Leaf Oil, Fragrance, Menthol, Tocopheryl Acetate, BHT, Alpha-Isomethyl Ionone, Limonene, Coumarin. This is a good oil as beard oils go. However, the smell is overwhelming. It is a strong, incense, musky fragrance that has nothing to do with the proclaimed cedar tones. I used it over a weekend and could barely live with myself. Unlike most smells, it seemed continuously pervasive. I stopped using it when it was time to go to the office as I did not want to inflict the smell on others. This is a shame as I have a heavy and thick beard and Proraso made it soft and easy to comb. There are many equally good oils out there, like the Penhaligon's Bayolea and Sartorial oils and you can of course experiment and make your own.....the base oils are readily available on the internet and my beard laughs off grapeseed oil, the base oil for most manufactured products. Therefore, give this one a miss unless you want your smell to precede you. really good delivery service, well packaged, the oil its self smells really good but not over powering and softens hair leaving it itch free. Mankind where really good and keeping me updated with me shipment and I will defiantly use this site and product again. 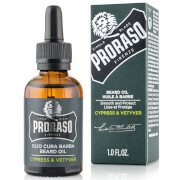 Proraso have great shaving products and now that I have a beard they've proven to provide great products for facia lair too. Can't wait to try the beard balm next, the oil is excellent and smells great too. Great smell and makes beard feel soft. 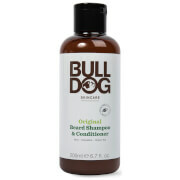 A little goes a long way with this product. Helps if you have itchy beard, did for me.